Visitors to the National Mall in the last decades of the nineteenth century walked a very different landscape from what we see today. The mall was smaller and terminated near the Washington Monument in marsh and river. It was also greener and shadier, a patchwork of pleasure grounds popular with the horse-and-carriage crowd, and botanical gardens renowned for their variety. A photograph, ca. 1890, reproduced in Kirk Savage’s essential and handsome new book, shows deer on the mall, grazing near a serpentine gravel road meandering under a low and dense canopy of trees. In 1884, when the Washington Monument was finished after decades of delays, the Smithsonian Castle stood next to the recently built polychrome brick fantasy of what was then known as the National Museum. (Today it is the Arts and Industries building, currently under renovation.) Together they suggested the possibility of a heterogeneous civic architecture not slavishly dependent on reiterations of the classical temple. Most of the white palaces of culture and government which now line the orderly north and south boundaries of the mall were still decades away from conception and at least a half century away from completion. The most powerful passages of Savage’s fascinating history of monuments in the nation’s capital document the transition of this lost nineteenth-century landscape into the long vistas and formal geometries of the Senate Park Commission plan of 1901-1902. Better known as the McMillan Commission plan, it called for the wholesale decimation of botanical, topographical, and architectural variety on the mall, in favor of a clear-cut greensward, flanked by orderly ranks of trees and surrounded by neo-classical architecture. Savage is right to insist that this was not just a physical transformation of the landscape. It was, more largely, part of a philosophical shift in how we think about civic land. Public “grounds” were being transformed into public “space,” and emptied of their “locally agreeable” features (the phrase was Frederick Law Olmsted, Jr.’s, a major proponent of the remade mall). The pleasure of being rooted to the earth and surrounded by trees was giving way to the more intellectual thrill of seeing the national ideal represented in spatial terms, grand and powerful, connecting abstract ideas about the American project into a coherent whole. Nature was being demoted by culture, and landscape was delivered to symbol and allegory. “The nation would have to make itself present, to find a space for itself, by replacing local attachments with an instantly grasped spatial unity,” writes Savage. History moves fast in a democracy, and most Washingtonians have forgotten the long and painful process that wrought the Mall we know today. But Savage reminds us that battles were still raging in the 1930s, when workmen felled huge old trees in front of the Museum of Natural History. Proponents of the McMillan Plan argued that they were merely reviving Pierre L’Enfant’s original city design, which called for a grand avenue running west from the Capitol. But as Savage convincingly argues, this was a sleight of hand. What the progressive planners—many of them veterans of the Chicago Columbian Exposition of 1893—had in mind was radically different. They imagined not an avenue but a systematic void, drawing the eye to rigid incarnations of statist power. The drawings and the models that they produced were breathtaking, and stirred the hearts of men such as Theodore Roosevelt. But not everyone was convinced. “It took some time for many of the locals to grasp the full impact of the Park Commission’s plan,” Savage writes, “but once they did they reacted as any group might to the threatened destruction of a cherished landscape.” There were bitter protests and recriminations. One cartoon, published in The Washington Star in 1908, shows awkward and angular little bureaucrats marching in lockstep towards the Capitol, holding perfectly squared off trees in cubical planter boxes—a bitter comment on the replacement of mature trees, planted over the years in more organic patterns, with straight files of carefully manicured elms. And it wasn’t all just local squabbling over memory and turf: as early as 1924, Lewis Mumford bemoaned the “imperial façade” which the mall’s design would put forth to the world. This battle, like so much of resistance to new monuments in Washington, has disappeared from memory. So has the texture and feel of the nineteenth-century capital that was remade by the creative destruction of the City Beautiful advocates behind the McMillan plan. Before the Lincoln and Grant Memorials (which stand at opposite ends of the East-West axis of the Mall) were finished in the 1920s, the monuments of Washington formed a network drawing visitors deep into the city. Tour books suggested routes connecting the various squares, circles and parks where an unsystematic but variegated pantheon of military and occasionally cultural leaders could be found. The new mall changed all of that, overwhelming a patchwork of men on horses with a more forceful narrative, ultimately severing the mall from the city. At first it was a narrative of Civil War, reunification, and new imperial ambition. But as the decades wore on, it changed into a narrative of victims and healing, embodied most powerfully in Maya Lin’s Vietnam Veterans Memorial. Although very different in its aesthetic, even the pompously nostalgic World War II Memorial is still playing out ideas of national trauma and grief hinted at in the Lincoln and Grant Memorials and brought to full fruition in the Vietnam War Memorial. Nicholas’s passion for abstraction was ultimately channeled into the monument that would eventually be built to honor Washington. 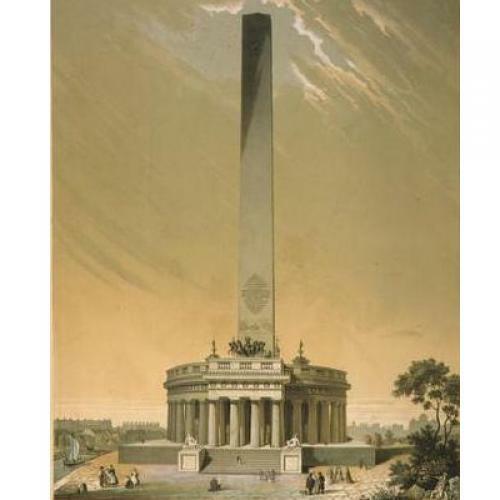 After an initial start on architect Robert Mills’s design of the 1840s—an odd hybrid of obelisk, colonnade and grandiloquent statuary—the project ran out of funds, and languished until Congress put its completion in the hands of Thomas Lincoln Casey of the Army Corps of Engineers. Changes to Mills’s design are often treated as cost-saving measures—a claim made in recent editions of the American Institute of Architects guidebook to the city. But Savage argues that Casey, a technocrat with peculiarly prescient vision, intended something entirely different, outmaneuvering frequent attempts to build a more traditional monument, cluttered with carving, ornament and inscription. One proposal, early in the process, shows the stump of the partially converted monument converted into a Gothic Italian bell tower, slightly reminiscent of the fantastic gaudiness of the Albert Memorial in London’s Kensington Garden. Casey, instead, wanted a pure form, a geometrical abstraction. He went so far as to strip existing ornament off the door frames of the partially completed memorial he inherited. The power of Casey’s vision—the introduction of a new formal purity into monument design—helped shaped the vision of the mall that would come two decades later. The finished Washington Monument not only dominated the space around it, it also offered visitors a bird’s-eye view of the city. It introduced new conceptions of how urban space looked, which were in turn reflected in the thrilling bird’s eye views of Washington presented by the McMillan commission in models and drawings. Savage ends with a “modest proposal” for a ten-year moratorium on new monuments while artists and designers explore “temporary installations, interventions, and reinterpretations throughout the landscape.” Some might point out that there is already a moratorium on new monuments on the mall (frequently trampled on by Congress), and that Washington has already dipped its foot gingerly in the not so avant-garde world of “temporary installations, interventions, and reinterpretations” without reforming its seemingly insatiable desire to memorialize with permanent intrusions on the landscape. His idea is interesting, but not as interesting as his very good book deserves. Readers energized by Savage’s rediscovery of a broader and more consistent resistance to the arid landscape of vulgar memorialization might be inspired to even more modest (or radical) proposals. Perhaps it is time to consider unbuilding the mall. Arguments coached in the language of preservation and sustainability might call for replanting the nineteenth-century Smithsonian Gardens. Resisting the forces of crass memorialization does not require sacralizing the mall’s space. The mall must be a living mall, in the way that the Constitution must be a living Constitution. As Kirk Savage so expertly documents, new forces will continue to lay claim to the mall, and the City Beautiful may yet yield to the City Livable, the City Functional, and the City Local.